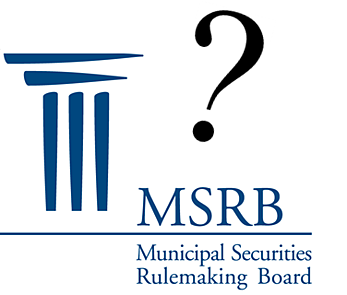 MSRB: On MA exam, what is “Forfeited Option Value” in a Refunding? There’s only so much that can be gleaned from an outline, but I’m focused on the “forfeited option value” refunding consideration. I frankly hate the “Webster defines [insert topic]” approach to a subject but given I’m only looking at three words, I’m reluctantly going to do just that. To forfeit is to “lose or give up something as a necessary consequence of something else.” In this context, the refunding presumably results in a loss or "forfeit" of option value. But to lose something means you actually have to have it to begin with. And this is the cognitive disconnect that really needs to be understood before people get too inebriated by their own quantitative Kool-aid. As I’ve discussed now on numerous occasions, refunding timing is hard because it’s an interest rate risk management decision that has and always will involve both an interest rate view and a risk preference. The really convenient (but completely bogus) thing about so-called “standard” bond option models applied to muni callables is that they quietly whisk these two essential realities under the rug. The interest rate view is dished off to forward rates embedded in today’s yield curve and the risk preference is assumed away neatly because “standard models” are predicated on risk-neutral (read “no-arbitrage”) and not real-world markets. But who cares about these minor details when we’ve got a “working” model that solves the universe’s refunding problem?!? Let’s just move on and talk about “efficiency” and “(sub) optimal timing” and perhaps even “forfeited option value.” In a word, bunk. For refunding analysis, the main reason a muni issuer should apply any quantitative model to its embedded call option is to assess some measure of how many potential birds in the bush there are relative to the bird in the hand (refunding) today. Many issuers with 2017 and 18 call features are are grappling with this right now. But this distinction is exactly why we work very hard in our own research on muni callables to label what some might call “option value” as “expected present value (EPV) savings.” To call something a “value” is to imply in my mind that people (more than just a mathematical model) agree that it's somehow convertible to dead presidents. As in, “Hey I’m gonna turn that fabulous 'option value' into some cold, hard green.” But if you’re a muni issuer trying to sell those calls, good luck with that. The "option value" that anyone comes up with for a muni callable is just a number spit out of a flawed model. And make no mistake, as George Box put it so eloquently – all models are wrong, some are just useful. So taking the very real and actionable economic result of a refunding today, putting it on the same ledger as some very unattainable and imaginery “option value,” and calling the difference “forfeited” simply ain’t right. It would be a bit like telling someone who takes the proverbial bird in the hand, “Hey, you’ve got 1 ‘forfeited bird’ there because there were 2 in the bush.” The 2 in the bush entail risk. The 1 in the hand doesn't. Put more simply, you can’t “forfeit” what you don’t got. If I haven’t misinterpreted these 3 words in the outline (an admittedly real possibility), this is actually the same shade of mistake made in that irretrievably flawed paper on Advance Refundings that tried to define “loss” relative to some unicorn output from an inapplicable option model. I hope I'm wrong; I do expect more from the MSRB test committee than a few academics analyzing a market they don't understand. But if I'm right, I hope they put some serious thought into the relevant test questions.